The Rippel Less Lethal Multi-Shot 40MM Launcher (RLL40) is a double action, multi-shot, launcher that was develped from Rippel Effect's 40MM Extended Range Grenade Launcher (XRGL-40) that is currently in use by numerous military forces around the world. The innovative design of this multi-shot launcher provides the operator the ability to reverse or forward select munitions without opening the launcher enabling the operator to select a skip fire or direct fire munition as needed. The flip out cylinder can be configured for either left or right handed operation. It is designed to fire 40MM less-lethal ammunition1 including the ALS4006D REACT, ALS4060 Hornets’ Nest and ALS6727CS Multi-Projectile Launchable CS rounds. 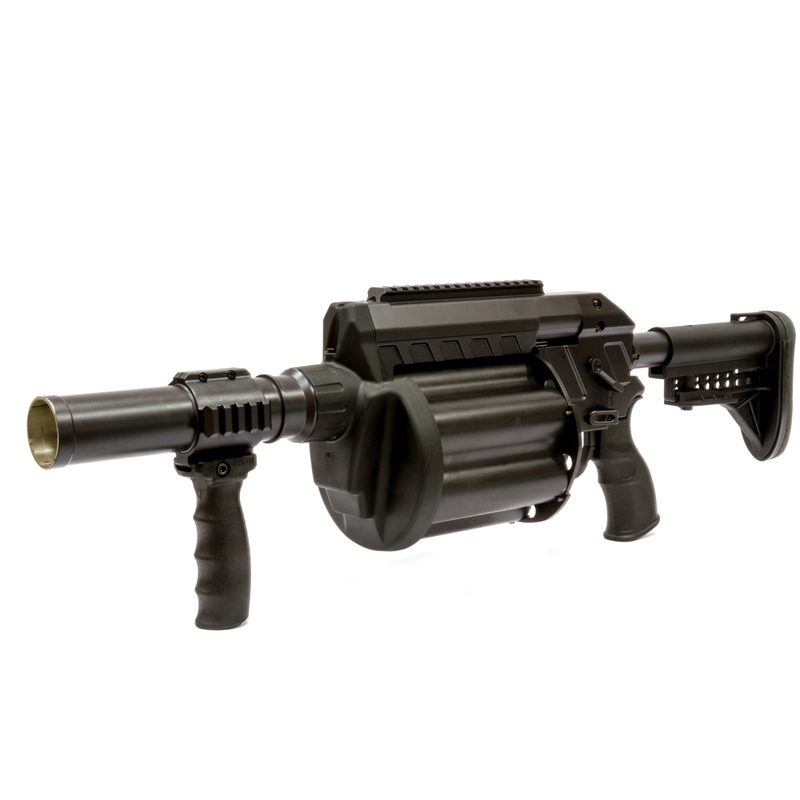 The rugged, lightweight construction of this multi-shot launcher makes it perfectly suited for use in corrections and crowd control environments. The RLL40 comes standard in a Black Nitride finish. It is also available with Less-Lethal Orange side plates, stock and foregrip. Custom marking is available by special order. The RLL40 launcher carries a 2 year warranty. ALS munition range chart sticker available upon request. 1Maximum length of cartridge with projectile should not exceed 5.5 inches. EXPORT NOTICE: This is an item controlled for export by the International Traffic in Arms Regulations (ITAR). These controls take the form of export regulations and license requirements. As part of the express consideration provided for receipt of AMTEC LESS-LETHAL SYSTEMS goods, technical data and/or services, you, our customer, acknowledge that the export, re-export or other transfer, directly or indirectly, of the goods, technical data and/or services provided by AMTEC LESS-LETHAL SYSTEMS in violation of U.S. law is prohibited. Customers acquiring ITAR goods, technical data and/or services from AMTEC LESS-LETHAL SYSTEMS shall be responsible for obtaining any necessary U.S. or other government authorization required to ensure compliance with applicable export laws.